Ada pertanyaan untuk Karona Resort & Spa? Ketika mengunjungi Phuket, Anda akan merasa layaknya di rumah ketika berada di Karona Resort & Spa yang menawarkan akomodasi berkualitas dengan layanan luar biasa. Hotel ini tidak terlalu jauh dari pusat kota, hanya 30 km dari sini dan umumnya hanya membutuhkan waktu 55 menit untuk mencapai bandara. Bagi Anda yang ingin berjalan-jalan, Stadion Peringatan Ibu Suri, Dino Park Mini Golf, M.G.Collection hanyalah beberapa dari obyek wisata yang tersedia bagi para pengunjung. Gunakan kesempatan untuk menikmati pelayanan dan fasilitas yang tidak tertandingi di hotel Phuket ini. 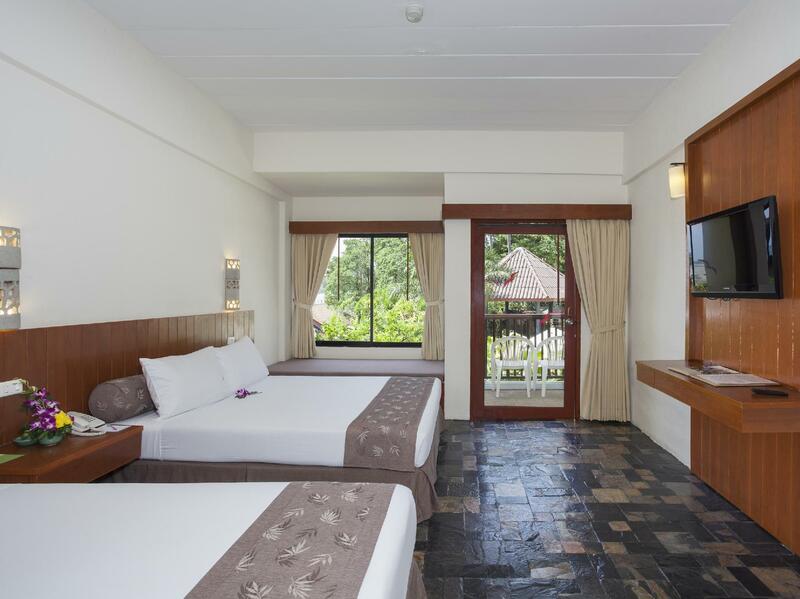 WiFi gratis di semua kamar, resepsionis 24 jam, check-in/check-out cepat, penyimpanan barang, Wi-fi di tempat umum hanyalah beberapa dari fasilitas yang membedakan Karona Resort & Spa dengan hotel-hotel lain di kota ini. Suasana Karona Resort & Spa tercermin di setiap kamarnya. televisi layar datar, akses internet WiFi (gratis), kamar bebas asap rokok, AC, layanan bangun pagi hanyalah beberapa dari fasilitas yang dapat Anda nikmati. Hot tub, sauna, kolam renang luar ruangan, spa, pijat di hotel ini adalah tempat-tempat ideal untuk bersantai setelah hari yang sibuk. Temukan paduan menarik dari pelayanan profesional dan sejumlah fasilitas di Karona Resort & Spa. Akses Wi-Fi/Internet tersedia di seluruh area properti. Staff were the best I've encountered. Started with a Supreme Room but because there happen to be a walkway to the pool by our balcony there was no privacy unless curtains closed. Changed to Sea View which was perfect. Breakfast was good, not great only because of fewer options for a buffet. The ride from the airport was a little longer than to Patong or Phuket. I recommend this resort & would stay again. I give 10 for this hotel.The check-in time of this hotel is 2pm.We arrived early and felt sorry to wake them up.But the hotel gave us four person free breakfast and early check-in.And it was New Year's Eve the day we arrived, so we were lucky to be invited to the gala party.It was obviously an unusual New Year for all of us.Exoticism, cheerful party,nice show,funny lucky draw,a big meal, Muaythai and also lady-boy,everything is perfect.I would recommend the hotel to my friend. The day we arrived the room we booked was out of order due to an electric problem. We were upgraded to a lovely massive suite, which was good of them. The breakfast is great also. 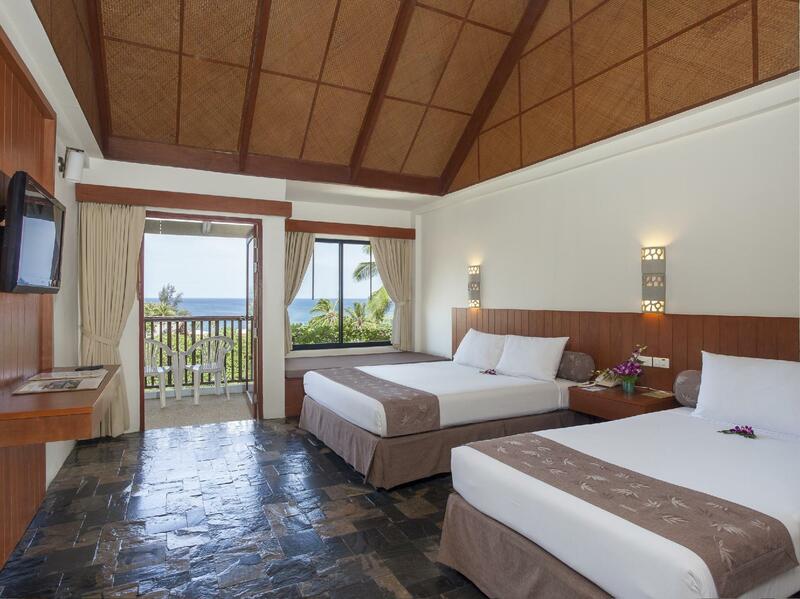 The location to the beach is wonderful and to the shopping area of kata beach. The staff also were most pleasant. The pool is excellent. I would recommend this place for sure. It is quiet also. I will definetly be staying here again when I next go to Phuket. Hotel was just off the road to the beach and in centre of town so handy for shops and restaurants. Has a nice pool and they provide towels. The room was clean but could do with some updating. Pleasant stay, I'd go back. My little son, wife, and I have stayed here for 3 nights so far so good. Pros. - Staffs are nice and very friendly. When I asks them how to get into Phuket landmark, they're willing to explain and also recommend another interesting places to visit. Last but not least, I forgot my wristwatch in the room. Fortunately, the staff found it and took it to me before I left. Super awesome service. - Swimming pool is awesome and clean so that my little boy has enjoyed playing the pool every morning and evening. - Breakfast food is average but it's included with booking. This can save us the money and time to find the restaurant in the morning. Cons. - Hotel doesn't have elevator, so it's pretty hard for family with little child like us to stay at 3rd floor. My wife and I had to walk up and down while we must carry our son. ** I would recommend family with little children to request reception to reserve the room at lower floor. Eg. 1st or 2nd - Toilet doesn't have a bidet sprayer at lavatory and also the shower is ceiled at the wall. it's not comfortable to clean up or take a bath for our child. I twisted my ankle and went to the spa, the massager saw my swollen ankle showed great sympathy and gave me great massage,basically fixed my ankle, it stopped swollen after she finished.. never expect this from a spa center.. so I would recommend not only the hotel, but the spa! 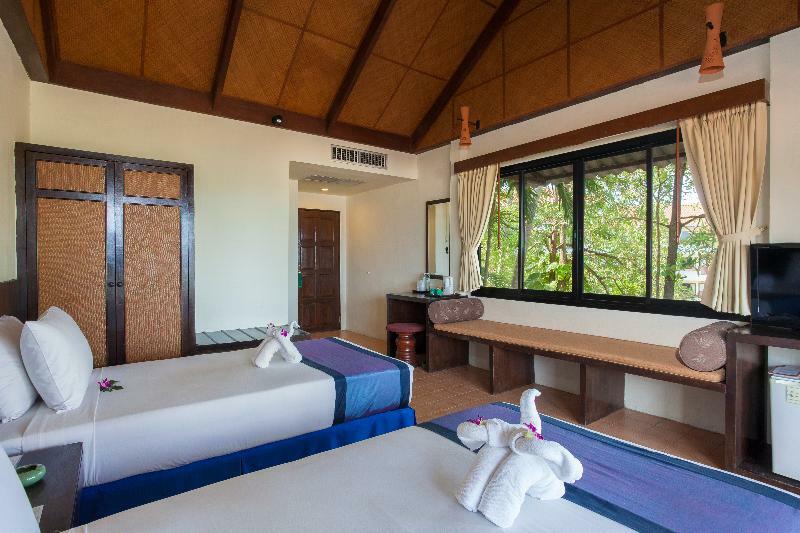 This is a good hotel that is a short walk to the beach and many shops and restaurants, only $300-400 BAHT to Patong Beach and close to all the tour areas. The stairs can be bit of an effort, there are no lifts so if you have elderly people with you choose a lower floor. This is my second time at this hotel and I notice that the breakfast was a bit sub standard this time, lots of Russians at this hotel, we were the only Aussies. We enjoyed our five nights here. The room was large with a nice view, but a little dark, and a joining door meant we could hear people next door, although they were thankfully quite quiet. We had a few mosquitoes but staff gave us a plugin which seemed to help. Breakfast was good with several homemade dishes changing each morning, and we liked many of them. We didn't use the pool but it looked nice, and the beach is only a 5 minute walk away. The cleaners were a little unreliable, sometimes forgetting to sweep everywhere, or not emptying a bin. But the staff overall were very friendly and helpful. Overall good value, but if you want something really special, you'll need to spend a little more. A wonderful hotel. Great value for money. Amazing breakfast. Our room was top floor and a little bit of a walk but nothing to worry about and staff did all the luggage so just a nice bit of exercise. An amazing breakfast, especially for the kids, a buffet and they definitely filled up. I'd stay again any time. The hotel is very quiet, just in front of a nice beach, near restaurants, bars and shops. We had booked a Room with sea view but we chose another one because the view on the sea is on the 5th floor without lift. Our room had a view on the pool and the sea as well. Very clean, big enough, nice terrace. A perfect stay with a helpful staff. We had a five day stay at the hotel. The rooms are comfortable and clean. Staff are friendly and helpful.Nice pool.We asked for dry towels coming back from the beach, not allowed. Only one towel a day.They organised a taxi to take us back to the airport. This is really the only thing we can complain about. It was an early pick up at 6:00. The taxi driver was yawning all the way to the airport and closed his eyes when ever he stop at a traffic light or stop sign. My husband spoke to him to try to keep him awake. The hotel is not new but it is located in the good area. Just a few minutes walk, you can see the beach. We had the upgrade room when we checked in which is really nice and the staffs are friendly. We aim to relax at the beach and the pool so this place is the answer. Foods are tasty with ok for the series of them. I will come back to stay this hotel again. My stay was not bad, however I had an annoying issue with a guest I brought at the hotel after one hour I reached the place (a local friend of mine), first they charged me 1,000 sgd even though I paid for two persons, the day after the canceled the 1,000 sgd charge but they called me early morning forcing me to make my guest check out until 10AM, referring to not well specified local laws (however the night before they did not tell me about this issue, they told me different things). Rude manners and confusing way to communicate. They did not provide me a transfer from the airport, answering my email after two days with a double price compared to the market (1,400 baht). I came in the hotel for SPA and for the sauna but the sauna was under renovation, SPA with prices above average. Restaurant good service but I did not like at all the receptionists. Cheers. They upgraded us to the suite room, which is very sweet. Location is great. Within 2 min's walk you can reach the beach, bars and restaurants. Only problem is most of the hotel rooms don't have a sea view. Otherwise this hotel is perfect with good value for money. I saw the reviews about karona that the breakfast was great and has many variety and that it's was beside the beach. I decided to try out two nights there. Turns out to very upset.. Reception was not welcoming, not helpful to my request on just late check out and spare keys . A lady name MAY was confidently arrogant and constantly toking in their local language .her attitude and facial expression was also very bad.there were no lifts and my parents and kids had to climb up 4 storey high all the time, bugs n mosquito in the room. No toothbrush provided. We were arranged a room that the air conditioner was out of order. Also, we were given a wifi password that cannot be accessed to internet. The receiption staff was not polite enough. The only good thing is some good restaurant nearby. Staffs were not friendly, room not provides tooth brush, maximum two towels provided, have to pay for the room safe if needed. Wont recommend to others.